Black incense burner with tin can of Arleris scented wax melts. Choose from over 20 fragrances. Arc en Terre are original incense burners, designed by our own studio, made from enameled pottery. Put a tea light candle in the burner and place one or two 'Arleris' in the stainless steel dish, without adding water. The warmth of the candle will melt the Arleris and the aromatic perfume will be released. 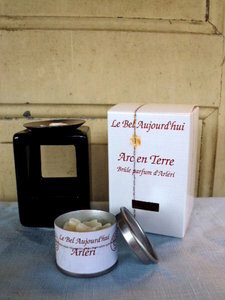 Packaging: Arc en Terre comes in a white cardboard box with the logo of Le Bel Aujourd'hui. Choose your favorite Arleris perfume: we have over 20 fragrances available. Dimensions: (h) 3.1 x (w) 2.4 x (d) 2.4 inch.